← Dawn Patrol from Kim Beattie’s And You! World War 1 in Colour…. 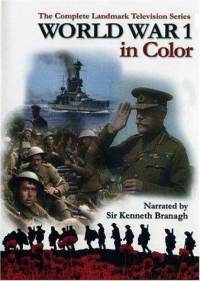 One of the more exciting documentaries about the Great War to be made in the last decade is World War 1 in Colour. Narrated by Kenneth Branagh, the series premiered in the UK in the fall of 2003, and was released on DVD in the U.S. a few years later (hence the missing ‘u’ from the my DVD cover to the left). There were six fifty-minute episodes, packed with footage that has been digitally colourised. In the opening of each episode Branagh croons, “the fields were green, the mud brown, the flames bright” as black and white footage suddenly comes to life with colour. The Daily Telegraph in Britain included free copies of the series tucked into the newspaper in 2007. What’s with UK papers handing out DVD documentaries? And more importantly, why aren’t The National Post and The Globe & Mail doing the same here? Anyway….for your Sunday morning viewing pleasure, here’s episode one: Catasrophe. There’s about a minute of fluff at the beginning of the clip added by the chap who loaded the video on Youtube, but this version is the only one in HD. This entry was posted in Uncategorized and tagged Great War Documentaries. Bookmark the permalink.